I spent most of the afternoon and early evening hours during the “St Patrick’s Day” aurora on 144MHz but when that started to fade I thought I’d follow the aurora westwards, listening on 50MHz where I had already heard a few very strongly auroral GMs, peaking at an azimuth of around 320/330˚. At 21:02z I heard a weak and different-sounding signal, certainly auroral but more “Tone 5” than “Tone A”. 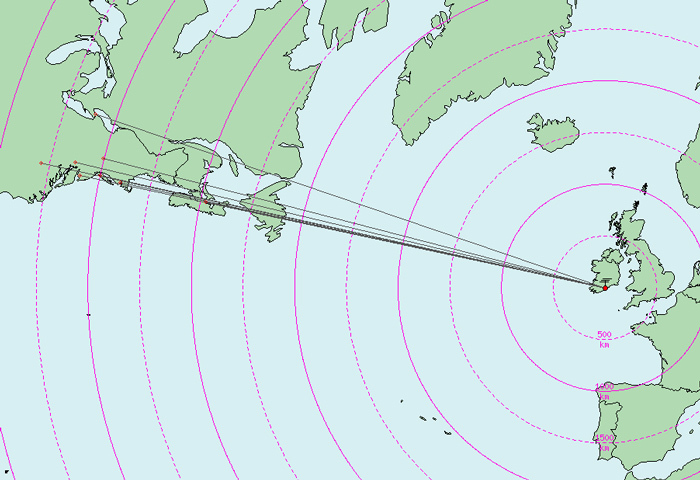 After peaking the signal at an antenna azimuth of approximately 295˚, it turned out to be K2PLF in FM19 at a distance of 5272km! Unfortunately my 100 Watts wasn’t enough to be heard by him but it was the start of a fascinating couple of hours, listening to many weak signals popping up as stations in the USA and Canada called and worked each other. Several North American stations were aware there was a transatlantic possibility and tried hard to optimise antenna headings, etc. In particular John, W1JJ, was heard here on and off for more than an hour but never got strong enough for my lower power to be heard. Fortunately, for a short while Doug VE1PZ‘s signal switched from aurora to auroral Es and came up considerably in strength – just long enough for a contact with myself and (the bit more QRO!) Tom, EI4DQ. It was fascinating listening to Doug’s signal switching between different modes of propagation, with all sorts of doppler effects and fading – the table below includes a few audio clips. The log of (identified) stations I heard is below with audio where available, including one contact with VE1PZ. One thing to note is that a lot of these signals seemed strong enough to have been easily workable with QRO at this end – something to consider next time, whenever that might be! 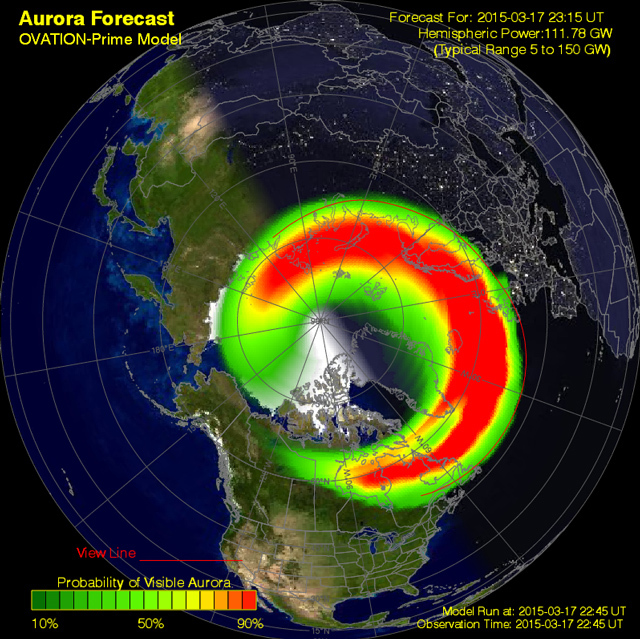 This entry was posted in 50MHz, aurora, auroral-Es on March 25, 2015 by Mark Turner. thanks for sharing these fascinating recordings here in your radio blog! I heard you earlier that evening working via the aurora on 144MHz. I was located on a hilltop near Liège, Belgium. My /P station was really not much more than a “backpacker QRP” station (FT-817 & home-made Moxon rectangle). But this certainly did not stop me from enjoying the memorable spectacle of the St Pat’s auroral opening (albeit only listening). I made some recordings and have uploaded a compilation of some of the highlights on my (PE7B) YouTube channel. The title of the video is: “St Patrick’s Day Aurora: 144MHz”. Your QSO with DL9NBD is featured, and I’ve also included the link to your blog entry in the list of references at the end of the video.